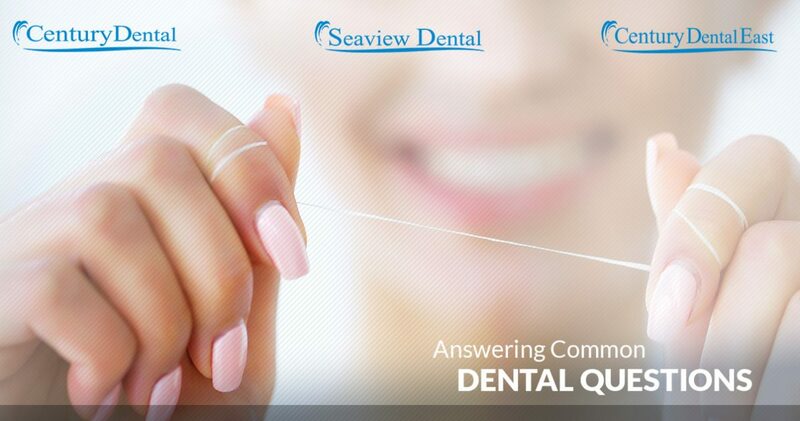 At Century Dental, Century Dental East, and Seaview Dental, patients often ask us questions about their oral health. In today’s blog, we will answer some of our most frequently asked questions. The American Dental Association recommends visiting your dentist every six months or at your dentist’s discretion. If you are having complications with your oral health, we may recommend more frequent visits. Do I need to see a dentist if my teeth are healthy? Yes! It can be tempting to assume you don’t need regular checkups if our dentists praise how healthy your teeth are at every visit. Most dental insurances will cover the cost of preventative check ups, so you have nothing to lose by stopping in at any of our three dental offices in New Jersey. Dental problems can arise quickly, but cavities and gum disease are not the only issues that our dentists address. When you come in for a check up, we will look for signs of oral cancer which can develop regardless of how healthy your teeth and gums are. Teeth can hurt for a number of reasons. It is possible that you are experiencing decay or an infection, or have sustained an injury. Other possibilities include receding gum lines that expose the nerves of the tooth, worn down enamel due to tooth grinding, or broken teeth. You might also be experiencing hot or cold sensitivity due to enamel that has worn down over time. If you are experiencing chronic toothaches, sharp or stabbing pain, or pain associated with cold or hot food or beverages, be sure to schedule an appointment to see one of our dentists for an examination. Our dentists can introduce you to high-quality, effective whitening products for your teeth. It is always best to whiten your teeth under dental supervision to ensure there are no major complications. Our dental practices offer the Boost Whitening System, which is the strongest tooth-bleaching system on the market. Can I use at-home whitening products? While you can go to just about any store and buy at-home whitening trays and strips, doing so can cause harm to your teeth and gums. Before suggesting a whitening treatment, our dentists will examine your teeth and gums to ensure they are in good enough health to handle a chemical whitening treatment. If you prefer an at-home treatment, our dentists can provide a take-home teeth whitening system for you. The best way to prevent gum disease including gingivitis and periodontitis is to follow a consistent oral hygiene routine and visit our dentists regularly for checkups and cleanings. Early detection of gum disease provides the most options for treating it. If you live in the Jersey Shore area, you are in luck! With three dental office locations (Seaview Dental in Eatontown, Century Dental in Jackson, and Century Dental East in Pine Beach), high-quality dental services are never far away. Whether you need to come in for a cleaning and exam or are seeking treatment such as dental implants or veneers, we can help. Schedule an appointment at any of our three dental offices today!